Are there 2 named women? Do they talk to each other about something other than a male character? Despite how ubiquitous the Bechdel Test has become, a depressing amount of films still don’t pass. Recently on Twitter, non-binary activist Jeffrey Marsh suggested a new test to measure the lgbtqia representation in media. 1. Is there at least one LGBTQ character? 2. Is that character played by an appropriate LGBTQ actor? Many people were quick to point out that Bechdel’s test originally appeared in Dykes to Watch Out For as a way of measuring the potential for a lesbian relationship between characters. However, the test has since become synonymous with female representation, and a test for the rest of the community is a useful resource. But with Glaad’s ‘We are on TV’ report regularly showing that there are fewer bi characters than lesbian and gay characters, and that the bi characters there are often still negative representations, Marsh’s test may be jumping the gun. So with more films and programmes claiming to represent bi people, how can we measure potency of bi characters? Is the character recognizable as bisexual within the media itself? Is the character’s bisexuality presented as a joke or flaw? Does the character ever say that they’re bi/pansexual? Popular characters that don’t pass because you could not tell they are bi from their media alone include; Valkyrie from Thor: Ragnarok and Wonder Woman from the 2018 film. Although people involved in the films said the characters are bi, there are no scenes in the film that show it. Several others don’t pass because because their bisexuality is used to show that they are a bad person, who is either untrustworthy or hedonistic, or both. Oberyn Martell and Piper are two examples of this, as their bisexuality is often offered as further proof of their promiscuity. Scrubs presents both Elliot’s and The Todd’s multi-gender attractions as a joke, and Britney from Glee is often subjected to biphobic jokes and comments as her bisexuality is dismissed. All these characters say they are bi at least once, but Darryl arguably does it the best – having a whole song and dance dedicated to telling the world he is bi. On the contrary, shows like Orange is the New Black have been criticised for their refusal to use the word bisexual. 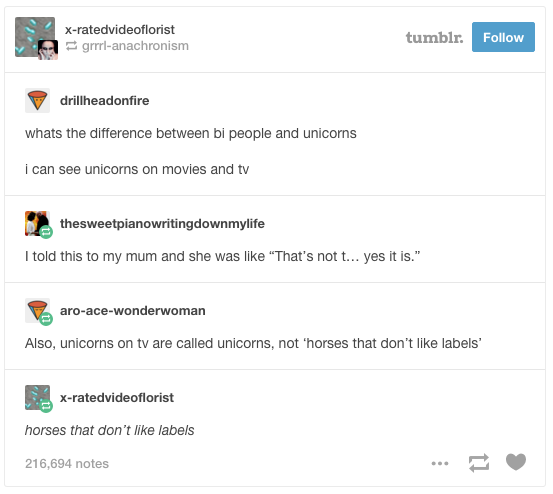 So many other character’s don’t pass because it is common for shows to shy away from the word “bisexual,” often having characters say they “don’t like labels” or are “just into people.” This happens so much that there’s a whole host of memes about it, including this great example from tumblr. Lois is a bi activist, who launched the DoBetterBiUs Campaign as well as the Bi Survivor's Network. In their daily life, they work as a content creator and freelance journalist. They are based in London, but their heart belongs to Brighton.